Starting point: The Gutter Bookshop, Cow’s Lane, Temple Bar, D2. Colm Keegan is a writer and poet from Dublin, Ireland. He has been shortlisted four times for the Hennessy New Irish Writing Award, for both poetry and fiction and has won the All Ireland Poetry Slam. His first book “Don’t Go There” was released to critical acclaim in 2012. His latest collection “Randomer” is out now with Salmon poetry. In 2011, he co-wrote “Three Men Talking About Things They Kinda Know About” – which toured Ireland and sold out in Bristol, London and Paris. His short play “The Process” was staged in the Abbey Theatre as part of 24 Hour Plays 2017. His debut full-length play “For Saoirse” was staged in Axis Theatre as part of Dublin Fringe 2018, and was nominated for the Fishamble New Writing award. Is Bleáthcliathach í Ciara Ní É. Ise a bhunaigh an oíche mic oscailte REIC, a mbíonn filíocht den fhocal labhartha, rap, ceol, agus scéalta le cloisteáil ann. Scríobhann sí i mBéarla agus i nGaeilge faoina shaol mar atá – ar ábhair éagsúla idir na taibhsí sa Chlub agus cad is ceart a dhéanamh nuair nach féidir leat téacs ar ais a fháil. Tugadh cuireadh do Chiara filíocht a dhéanamh ag roinnt féiltí éagsúla: Electric Picnic, Body and Soul, The Irish Arts Centre NYC, IMRAM, agus neart eile. Foilsíodh saothar dá chuid in irisí éagsúla, Icarus agus Comhar ina measc. Anuraidh roghnaíodh í don scéim Introductions de chuid Poetry Ireland, agus Scéim Meantóireachta Fhoras na Gaeilge. 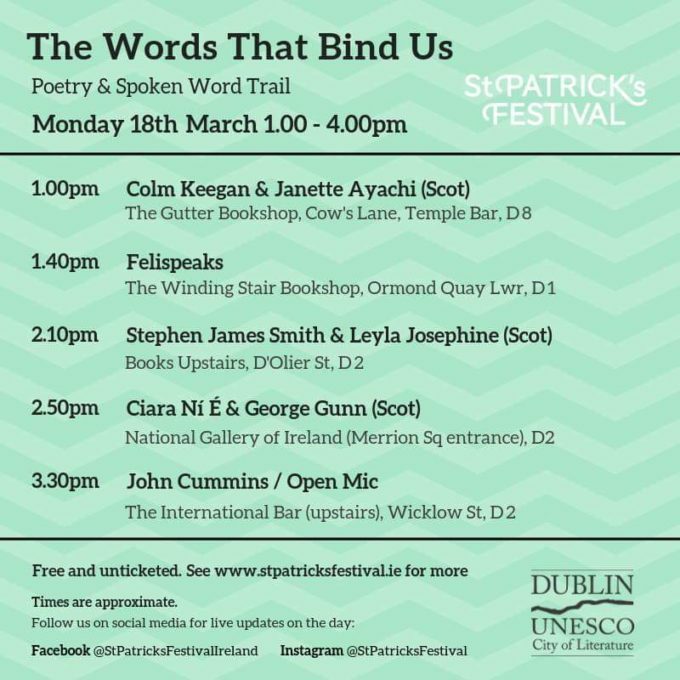 The Words That Bind Us is a project that brings together poets from Ireland and Scotland to collaborate with a new generation of young writers. Students from Trinity Comprehensive School in Ballymun have been working since January with the renowned poets Stephen James Smith (Ireland) and Leyla Josephine (Scotland) alongside weekly guest poets, to create new work through participative workshops as they explore the themes of belonging and identity. Leyla Josephine has also been working with a group of young girls to produce Creative Sisters; a female only creative space celebrating the power and potential of young women growing up in Dublin today. On Saturday 16th March, the culmination of work created during the workshops will be beautifully presented on the Axis stage featuring the poets and the students.